Archdiocese of Wellington – Four O’Shea Shield wins in a row! Home » Show as ADW news » Four O’Shea Shield wins in a row! Four O’Shea Shield wins in a row! St Catherine’s College O’Shea Shield winning team 2016. For the fourth consecutive year St Catherine’s College Wellington has won the highly-prized O’Shea Shield at the annual speech and drama competition for Catholic Colleges’ of the Wellington and Palmerston North Dioceses. Fellow Kilbirnie school, St Patrick’s College Wellington, were runners up. The competition was hosted by Sacred Heart Girls’ College in New Plymouth. Year 12 student and St Catherine’s College team member Jade Soffe reports. This year’s O’Shea Shield competition was held in New Plymouth over the weekend of 14‒15 May. Hosted by Sacred Heart Girls’ College, the annual event featured 17 Catholic schools from the Wellington Archdiocese and Palmerston Diocese. The 6am wake-up call on Saturday morning pulled us out of our deep sleep and we opened our tired eyes. The busy hostel buzzed with nerves and excitement. Crisp uniforms were pulled out of dry-cleaning bags and anxious conversations could be heard down the hall. Teachers and students fixed ties and pinned badges to school blazers. We could feel knots in our stomachs. Finally, all of the hours and hours of practice were to be put into action. Saturday morning began with debating and impromptu speaking. After lunch, students delivered their oratories and that evening, drama took to the stage at the TSB Stadium in the heart of the city. Sunday morning featured the highly competitive religious-questions’ event followed by scripture reading to close. 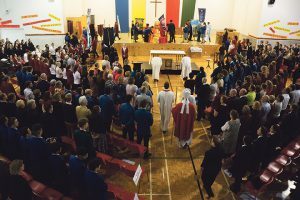 At 1.30pm on Sunday, students, staff and some parents from all of the competing schools excitedly gathered in the school hall for Mass and then the much-anticipated prize giving. All too quickly, the weekend came to an end and St Catherine’s College were proud to take home the coveted O’Shea Shield for the fourth consecutive year. Being one of the many O’Shea first timers on the St Catherine’s school team, I initially felt quite intimidated. I was representing an entire school, not just myself. Prior to O’Shea, I hadn’t done many interschool public speaking competitions, so to stand in front of an audience, and speak for eight minutes, with no cue cards, seemed a real challenge. My coaches and peers offered gentle reminders to not let my nerves get the better of me. What I and my peers gained from the O’Shea experience was truly invaluable. We put our skills to the test and mixed and mingled with interesting new faces from different Catholic schools, making new friends along the way. Mariah Wilson, a year 13 student from Garin College commented, ‘I will remember this experience for many, many years and am truly grateful for the opportunity’. Similarly enthused was Albert Fairbrother, a year 13 student from St Patrick’s College Silverstream, who said, ‘My first and only O’Shea was the most fulfilling moment in my five years at ‘Stream’. Right from the beginning to the end, O’Shea Shield 2016 didn’t fail to impress. Bishop Charles Drennan presides at Sunday Mass. The annual O’Shea Shield speech and drama competition is an iconic event. 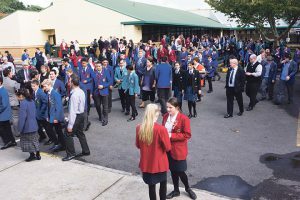 Every year it sees a school campus teeming with exuberant young people from 17 Catholic secondary schools spanning the two dioceses of Palmerston North and Wellington, reaching from New Plymouth in the west across to Hawkes Bay in the east and to Nelson in the south. These students have invested many hours honing their craft with the hope of doing well for their school. Students compete in a variety of speech and drama events over two days in the hope of winning the ultimate prize, the O’Shea Shield. Each event has a trophy, the results of which collate towards the grand prize the O’Shea Shield. Debuting in 1946, this competition is now in its 70th year. It is dedicated to the memory of Archbishop Thomas O’Shea whose lifelong commitment to the cause of Catholic education saw him chair from its inception the Wellington Catholic Education Trust Board, which was able to provide free tuition in many of the city’s Catholic schools. This annual event celebrates the youth of the Catholic Church and provides a focus for the expression of abundant talent. It also gives a sense of history to those taking part as many had parents and grandparents who have participated in the event. Andrew Murray is Deputy Principal of Sacred Heart Girls’ College New Plymouth. “Ahi ahi marie, haere mai to our kaumatua Rangikotuku Rukawai and Ngarati. Welcome to all of you to Sacred Heart Girls’ College and the city of New Plymouth this weekend. In this Year of Mercy at Sacred Heart Girls’ College we commit to opening our minds, hearts and hands by learning, connecting with and acting upon the Manawa Mission of Ako, Manaakitanga and Wahine Toa. – Paula Wells, Principal of Sacred Heart Girls’ College, New Plymouth. 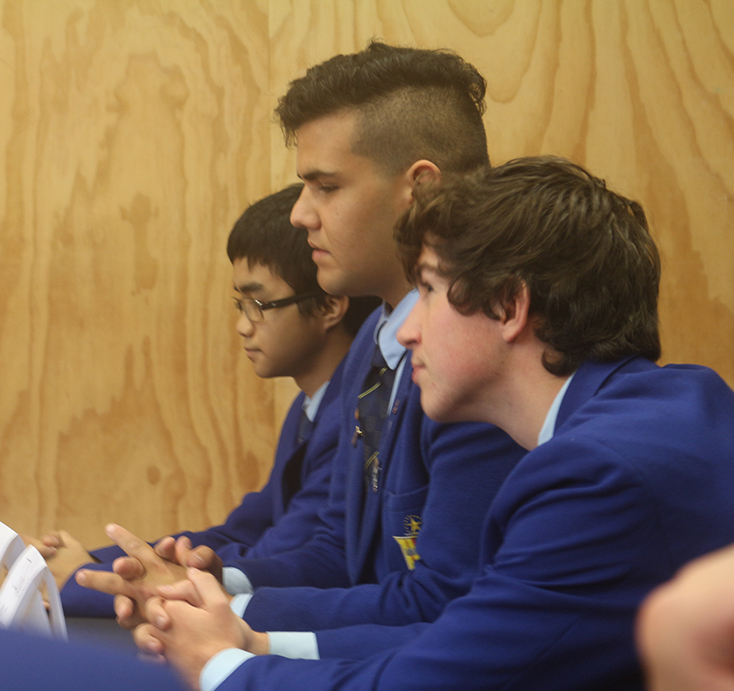 St Bernard College students Paulo Lopez, Matt Rothwell and Jack Masra answer religious questions. 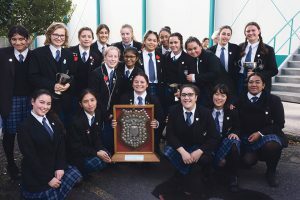 On the Friday before this year’s O’Shea Shield competition 24 students from St Bernard’s College made the long journey to Sacred Heart Girls’ College New Plymouth to compete in this prestigious event. Throughout the weekend every single student there was showing off the pride of their school and St Bernard’s College was no exception. Seeing my fellow brothers in blue representing our school made me feel just how strong the brotherhood is here. For many of us it was our first O’Shea. There were many nervous students before each event, but many happy faces afterwards. The O’Shea experience is something I will never forget – meeting new people from other schools built on the foundation of Christ, seeing the smiles on people’s faces after each event, and memories made that I will hold for the rest of my life. This year’s theme of Mercy was definitely present throughout the weekend. For many I think it was our own personal learning of mercy that made the event merciful. For me, I learnt what it means to show mercy through forgiveness in my religious drama. I want to thank the Marist Foundation Trust for making this event possible for us and we look forward to the honour of hosting O’Shea Shield in 2017 at our school. ‘Go in as seeds, return as blossomed flowers’ is a quote that definitely represents my school’s journey of O’Shea Shield 2016. Anthony Pan is 2016 O’Shea Captain, St Bernard’s College, Lower Hutt.